To play a character as loved and complex as Wolverine is surely a daunting task, one that Hugh Jackman has repeatedly knocked out of the park even when the writers have not. And while I personally didn’t find X-Men Origins as atrocious as most fans and critics did, I will admit much of the dialogue was trite and some of the acting was overdone, notably Will.I.Am as John Wraith. Call me old fashioned, but when I go see a movie that’s based off of a comic book featuring a main character who has adamantium bound to his skeleton and a supporting performance by a mediocre hip hop star, I don’t expect Best Picture material. I enjoyed Liev Schreiber’s performance as Victor Creed and the startling brutality of the action sequences. I never had the funds nor the desire to become a comic purist, so I was able to enjoy the films as a comic fan. I knew enough mythology to know where the story was going and trivia about the characters featured. 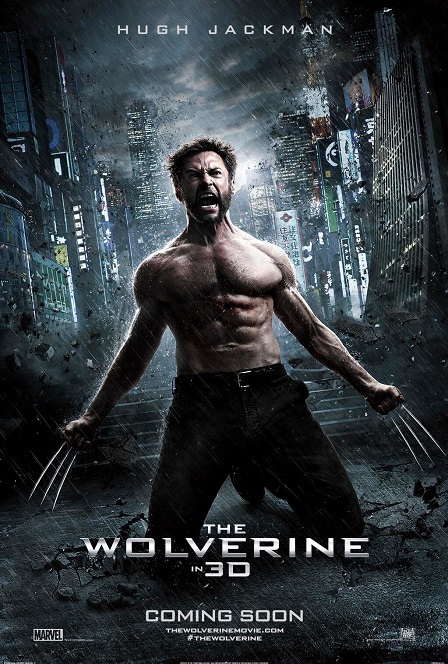 So I went into James Mangold’s The Wolverine expecting an enjoyable flick, and that’s precisely what I got. When our story begins, Xavier’s School for Gifted Youngsters is being run by Storm, the mutants who received the “cure” have not quite gotten their powers back, and Logan is living in a self-imposed exile. He drinks a bottle of whiskey a day, goes through D batteries like a single gal in the city (they’re for my transistor radio! ), and has eerie dreams of Jean Grey every single night. Then he receives a mysterious invitation from an acquaintance whose life he once saved, now a rich and powerful Japanese tycoon. How do you repay a warrior cursed with immortality? By giving him an honorable death. The Japan story arc is one of the most loved, but the adaptation isn’t of quite the same caliber. While it does feature some exquisite set pieces, and a strong physical and emotional performance from Jackman, it also features a lull midway through, a half-cocked love story, and a thoroughly ludicrous finale… Yes, even for a movie based on a comic book featuring a hero with adamantium bound to his skeleton. That being said, as a lifelong geek, I really liked this movie. It reminded me of a simpler time when I was a seven year old boy who wanted to be someone else. Someone fierce, and loyal, preferably with razor sharp claws and awesome hair. Two out of four ain’t bad. Approximately two months after its release, I at long last see the new Superman film. I have been a lifelong fan and yet I wasn’t excited about the idea of a new Superman movie until I heard that the brilliant filmmaker Christopher Nolan was involved with the development. In addition to excellent films like Memento and Inception, Nolan gave us an entirely new vision of Batman, and made comic book movies Best Picture worthy. This new incarnation of Superman was written by veteran comic book adapter David S. Goyer (Blade Trilogy/Dark Knight Trilogy) and is helmed by Zack Snyder (300/Watchmen). 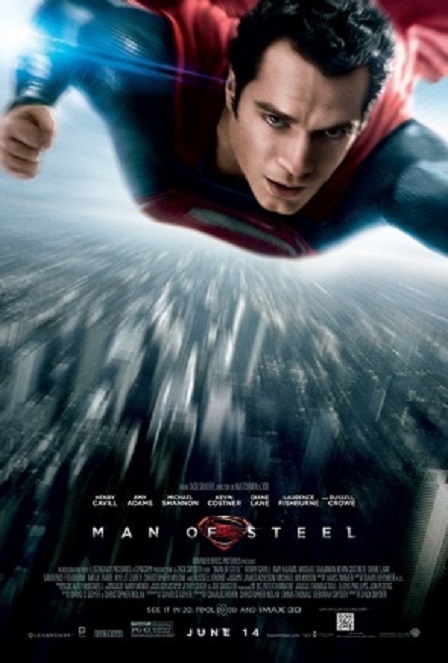 And while it isn’t quite as impressive as Nolan’s Batman, it soars above the past 3 Superman movies. Henry Cavill does a much better job, but the real standouts are (no surprise) Kevin Costner, Russell Crowe, and Michael Shannon as General Zod. Michael Shannon just looks like somebody you don’t toy with. Like he’s seen and done some things that haunt him; like he’s damned and he knows it. As a reboot, this film must establish an origin which it does through the use of flashbacks, draw on comic book mythology, but also up the ante as far as action and originality. Zack Snyder is excellent with action; originality is not really his thing (most of his films have been adaptations). Clark Kent has been living as a drifter for several years when our story begins. He travels from place to place, meets people and gets into adventures (like Caine in Kung Fu), usually moving on after saving some otherwise hopeless citizens from their certain doom. Then he meets Lois Lane and finds a Kryptonian ship in the arctic (the Fortress of Solitude? ), unknowingly alerting some Phantom Zone ex-cons of his presence on Earth, and he has something they want. Despite the limitations of making movies about a superhero who is all but invincible, there are still things to talk about (loneliness, isolation, being adopted) and stories to tell. Maybe a sequel with Brainiac, or Lex Luthor, or Mister Mxyzptlk would be in order. And to finish off the trilogy, an epic battle with Doomsday, the only villain to have succeeded where the others failed. And from what I hear, Batman and Superman will meet for the first time on film (no Christian Bale) so at some point, there will likely be a Justice League movie to get some of that Avengers mojo. Just no Aquaman, please.